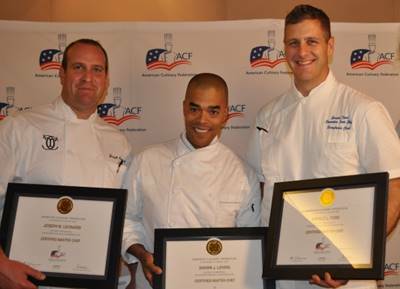 Congratulations to the 2017 American Culinary Federation Certified Master Chefs: Gerald Ford, CMC; Joseph Leonardi, CMC; and Shawn Loving, CMC, CCA. The Master Chefs’ Institute is pleased to congratulate the 2017 CMC exam successful candidates. The title of Certified Master Chef (CMC), presented solely by the American Culinary Federation (ACF) in the U.S., is the highest level of certification a chef can receive. It represents the pinnacle of professionalism and skill. Today, there are 68 CMCs and 10 Certified Master Pastry Chefs ® (CMPC) in the nation. To apply for the CMC exam, a candidate must be a Certified Executive Chef ® or Certified Culinary Educator ®, provide two letters of recommendation from current CMCs or CMPCs, and have completed education courses on sanitation and food safety, cost management, management and wine.